I love technology and I love that we live in an age where creativity can be displayed in so many ways with such little effort. Take for example my 5 minute creation of a workshop I took last fall with Carol Taylor. Using a program installed on my computer, Windows Live Movie Maker, I was able to create this. I can see a lot of applications for future sharing, so stay tuned! 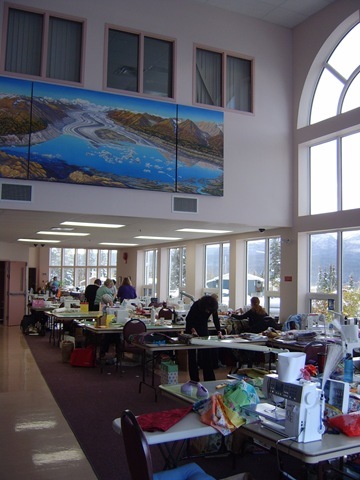 On a related note, tomorrow I am going to meet some of the ladies from my Guild, the Kluane Quilters Guild, for a show and tell and a yarn swap. It should be fun, and I’ll try to remember to post some pictures. And if you happen to wonder over to the video, I hope you enjoy it! 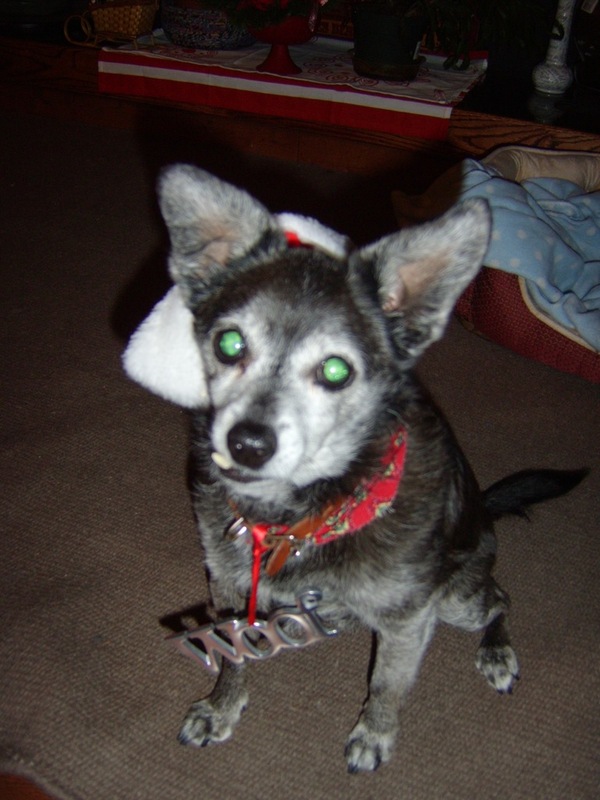 I have not added to this blog in a long time. A very long time! I have lots to show and I want to keep it as a journal progress, so I’ll be adding over the next few days. 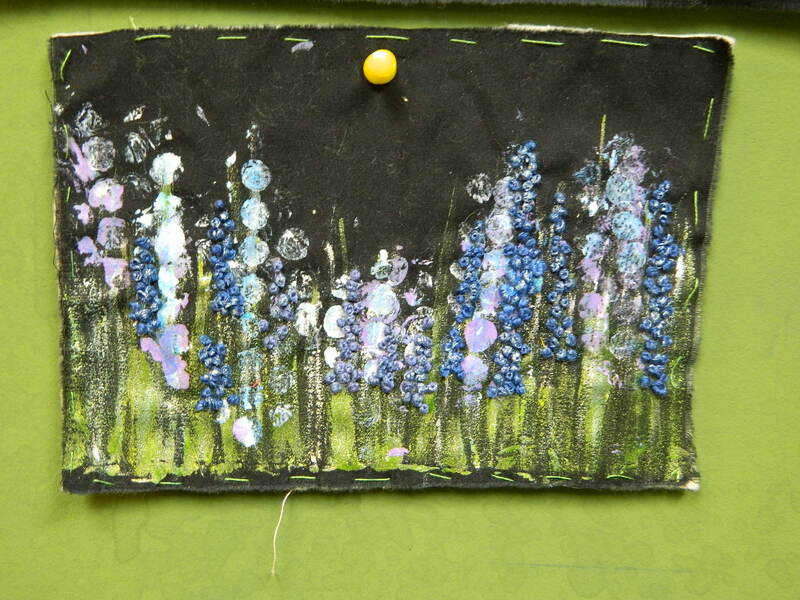 This piece is paint over bubble wrap on black fabric and detailed with a lot of french knots. I have basted around the piece and need to add a backing of some kind. I ‘think’ I’ll use a fusible technique to finish the edges.. Stay tuned! This month I was very busy making some Christmas goodies for family. 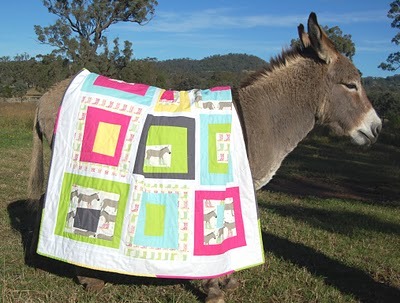 At the last possible moment my local quilt shop owner put out a desperate call for a table runner for a competition that she had not promoted very well. I had 2 evenings and managed to come up with this. The theme was ‘stars’ in some way. When I can find a picture, I’ll show it. 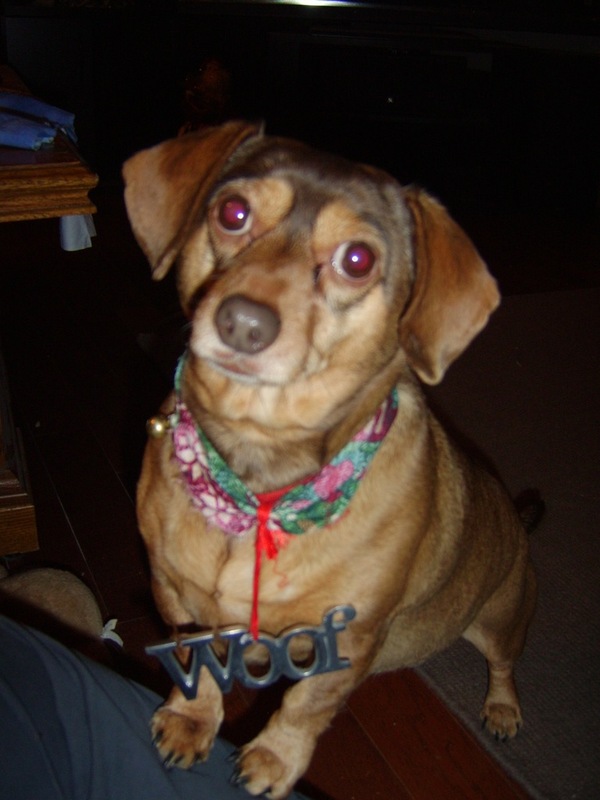 Oh yah—I came in second and won a free class! Since I teach at the quilt shop, this was a funny “win” for me. 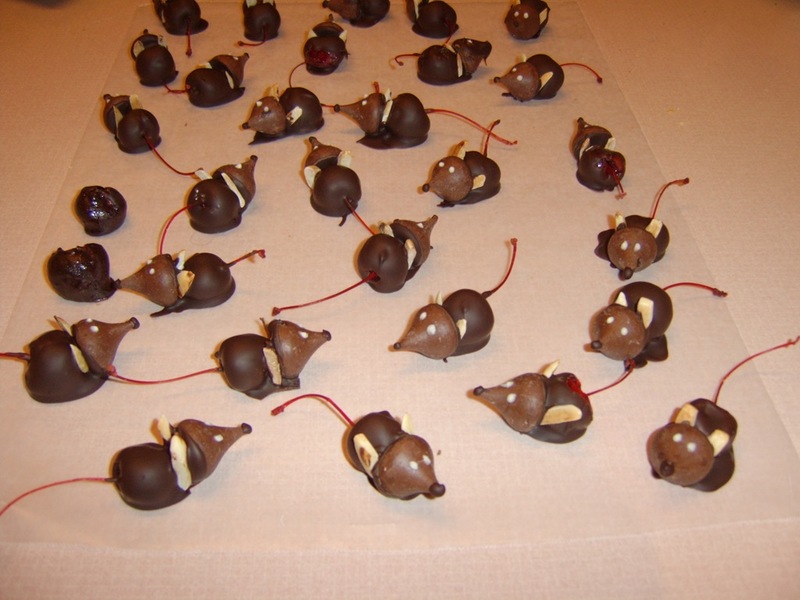 For Christmas every year I make these Chocolate Mice from this recipe. I usually let the cherries soak in rum for a few days to give it a more grown up taste. 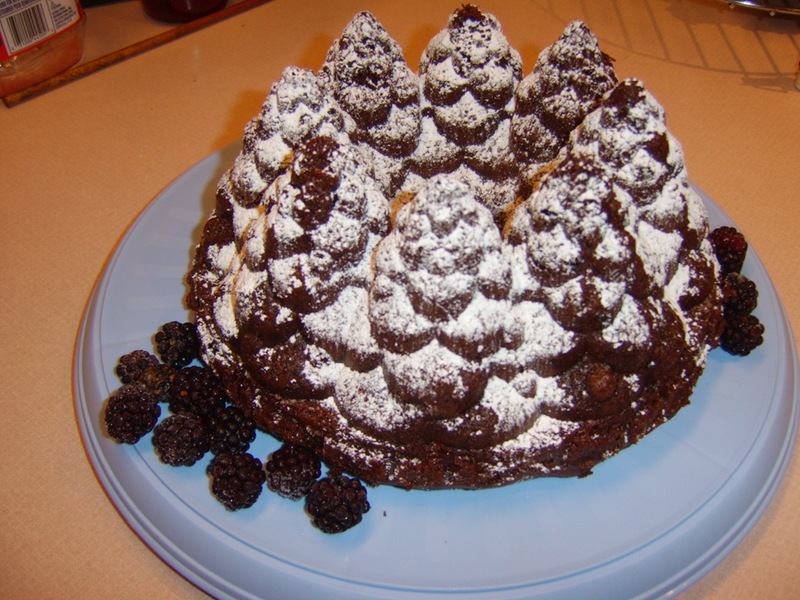 I also made a birthday cake for a friend who has a Christmas day birthday. 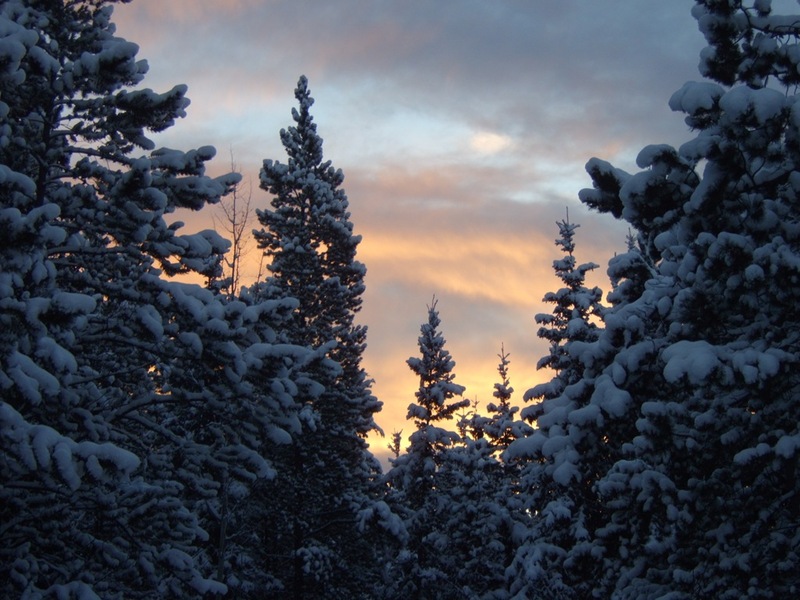 As I looked out my dining room window this morning, the sun was shining over the trees and I felt so grateful for what I have. My mom passed away a little more than a month ago and I decided to spend this Christmas at home rather than go outside to be with my husband’s family. I have good friends with whom I will spend some time with, and have a lot of things that will occupy my time. I had a lovely Christmas dinner with my friend Colleen and am looking forward to more visits with friends over the holidays. 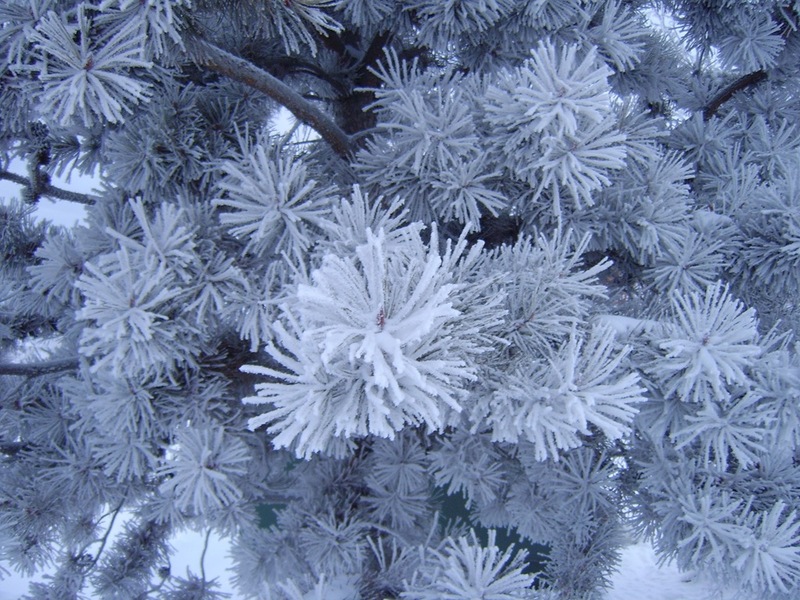 I hope you all had a wonderful Christmas day with family or friends and if you are alone I hope you had a peaceful day. Over the past 4 months, my online Dye Art Group has had an enormous project on the go. 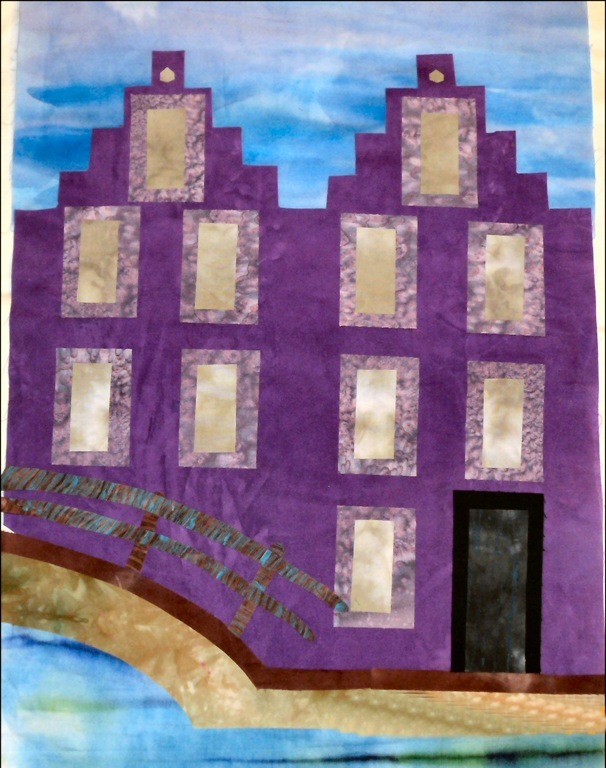 10 of us decided to do a ‘fractured quilt” of a series of canal houses. 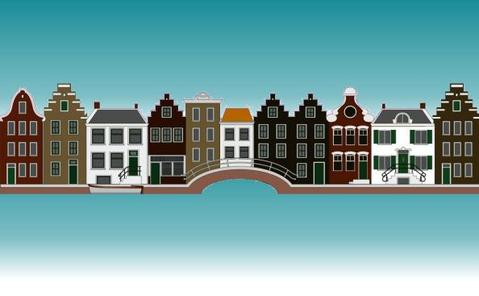 Our hostess lives in the Netherlands and canal houses are a common architectural design in her country. 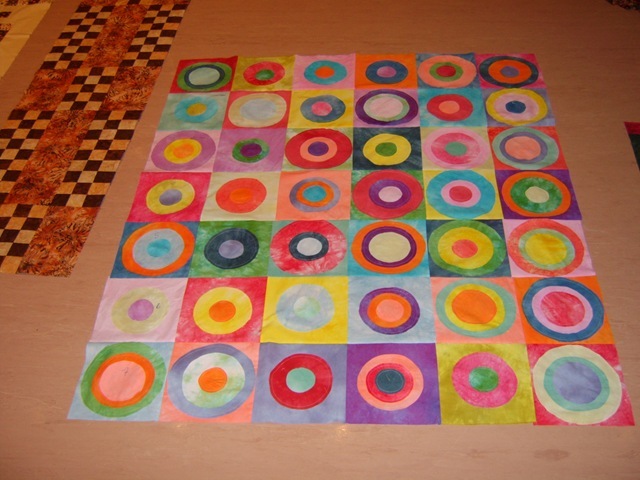 Last year a smaller group of us did a fractured quilt of a flower which was a lot of fun. This was mine chopped, but before it was sent out. 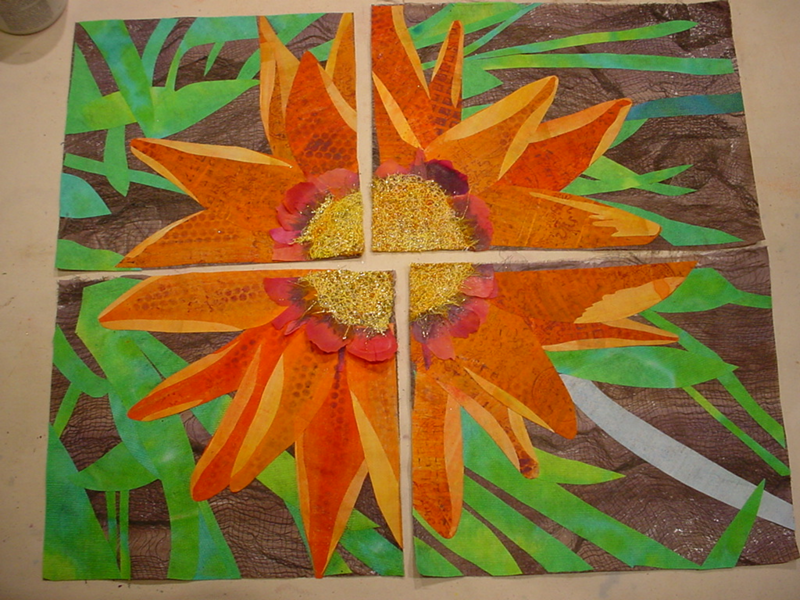 I used paper towel leaves, cheesecloth backgrounds, shrinking thread for the gold center and real (plastic) petals. The project this year consists of a series of houses that are enormous—so large, I could not get a picture of all of them until I rebuilt the individual pieces in Photoshop. I’ll show you that picture later. The hardest part for me was getting the distance from the bottom of the water to the canal walls. I had cut the patterns down just below the seawall so it was difficult for me to judge what the distance was. I eventually had to ask the group, thus letting everyone learn about my dumb error. 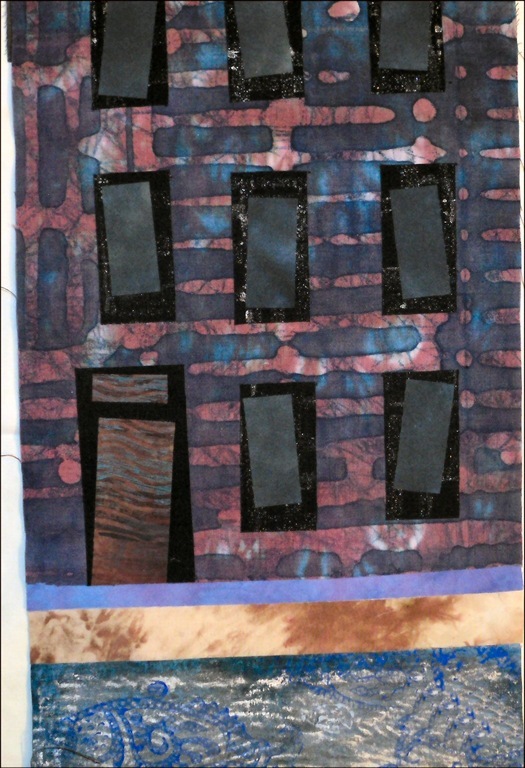 House—body is hand-dyed fabric with Shiva Stick rubbings. The top of the house has a foam sheet cut-out (the grey part). The windows were made by stitching multi-coloured thread in a grid fashion over water soluble film, then dissolving the film. 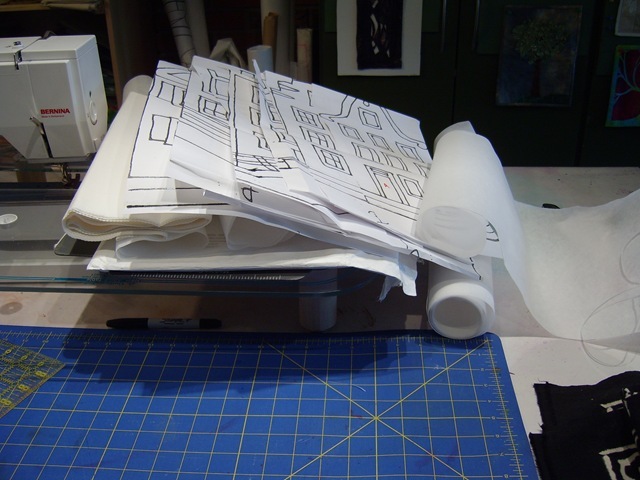 I then cut out a window shape. 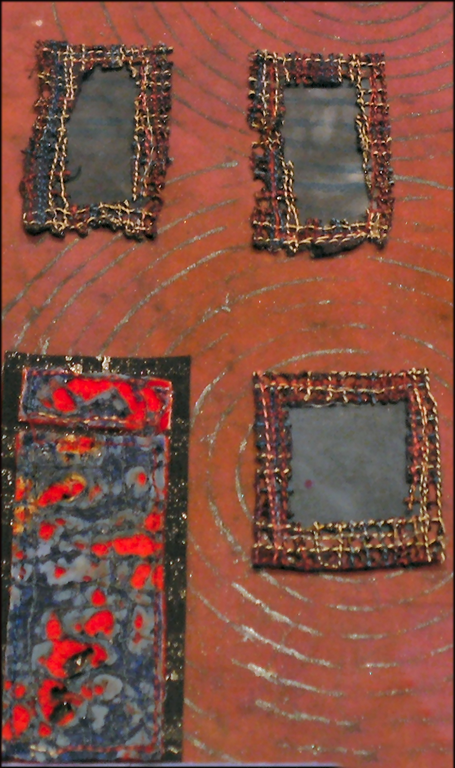 The door is Kunin felt with Tyvek stitched over it, then burned with a heat gun to reveal the various colors. It looks much less red in real life. Water—is a piece of cotton I folded and added green to the peaks. Sky—hand painted with Seta Colours. 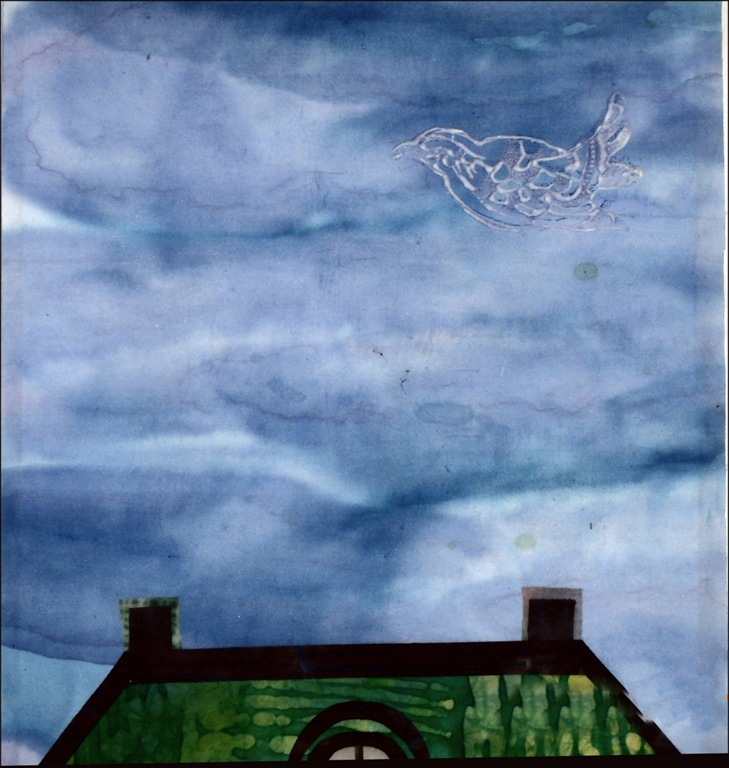 House—Dyed background and machine stitching in windows. 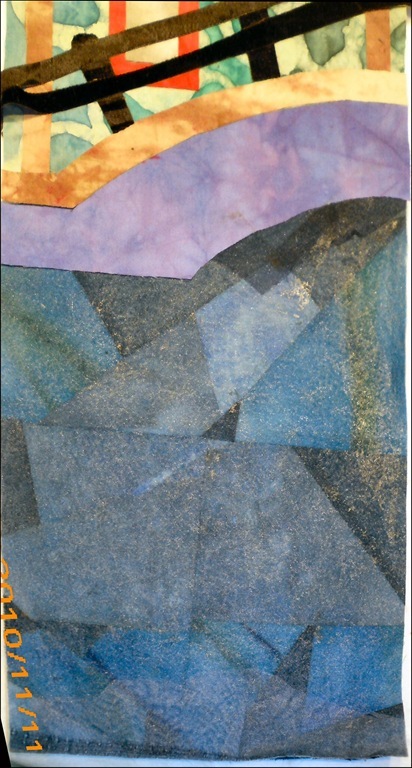 Water—monoprint, then crunched fabric in SetaColours, cut apart, then restitched. Sky—painted cotton. When wet, I threw rock salt on the top to give it the movement. 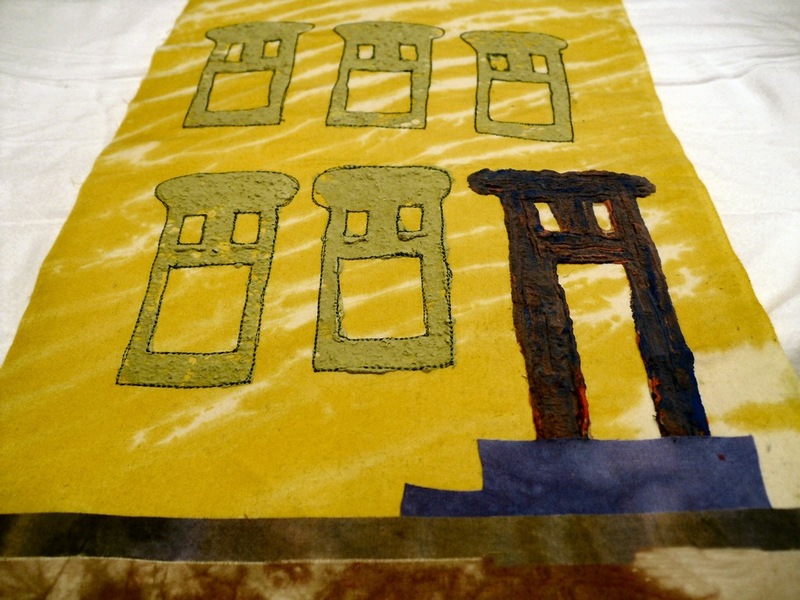 House—Hand dyed cotton fabric with Shiva Stick rubbings on top. The windows and doors are fused. The railing is made of a cashmere-like yarn. 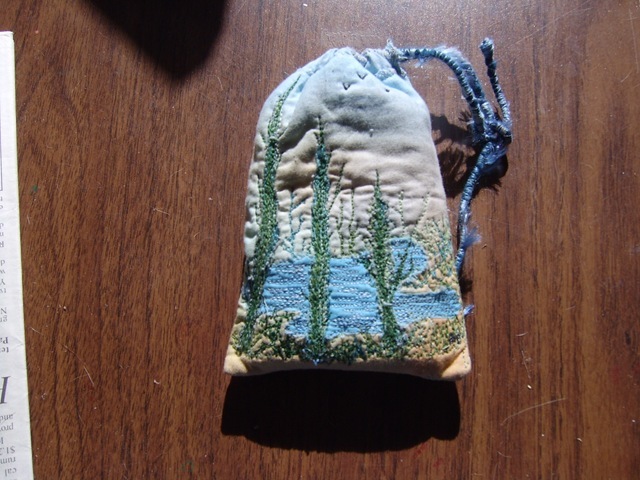 Water—hand dyed fabric, cut and re-stitched. Sky—hand painted. The bird is tinted puffy paint used with a stamp. Other birds are lightly painted in the sky with regular paint to give some depth. 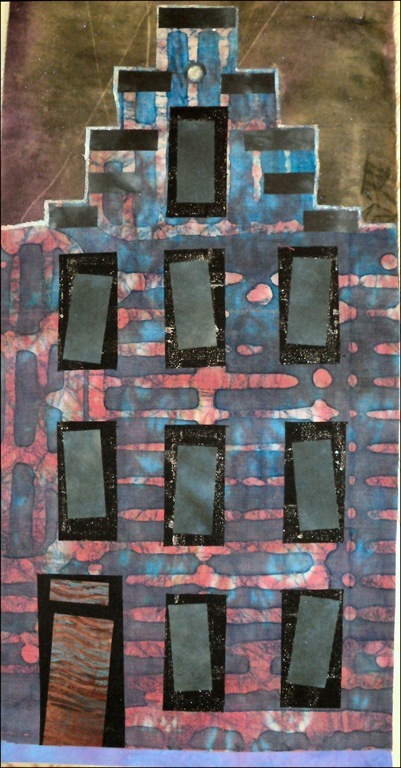 Body—Again, dyed fabric with Shiva Stick rubbings and fusible web windows, doors, etc. Sky—Seta Color and rock salt. 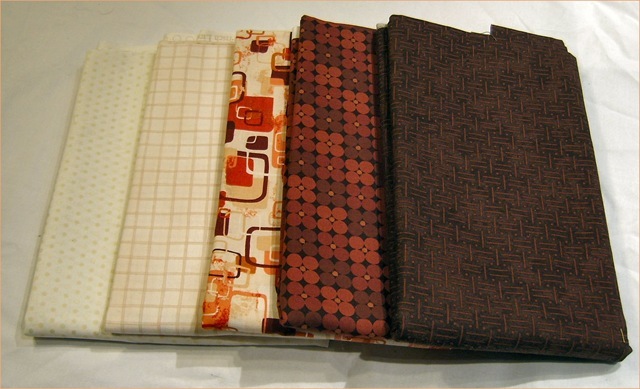 House—Soy wax fabric (I think this is a really neato thing). The fence is the only fabric I used in all of the houses that was not made by me. It is a brown velvet that shouted to be used. Water—It looked awful with the pieced background, so to rescue it I added blue, red and shimmery organza over it. Not so happy with what happened here, and will likely ask for it back. Somehow water seeped onto the fabric under the roof and above the window and has left a bad stain. Shoot. 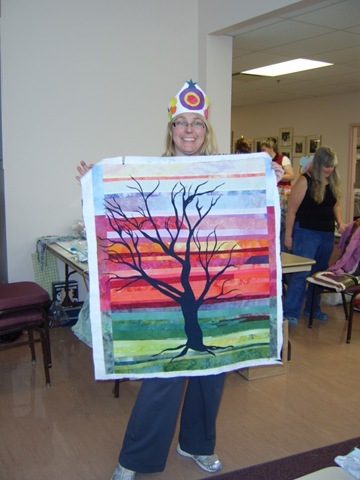 This was made with Tyvek windows with Angelina inserts and a fuzzy yarn railing. Nothing special here. 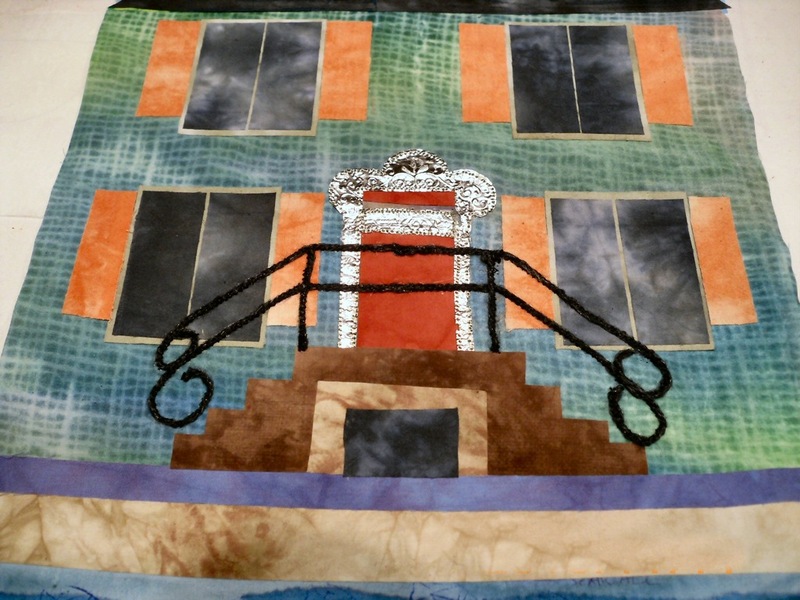 The door and railings is made with some stamped fabric that is really nice. The deep purple fabric has very faint Yukon fireweed imprints on them. This was an interesting and successful technique. The detail on the roof, the windows and door are made using tinted puffy paint. The windows and door were made by pounding a hand made stamp into the tinted puffy paint and applied to the fabric. It was difficult to see the pattern of the windows since the yellow background (shibori pole dyed fabric) and lime green are very similar. After loosely stitching around the windows to suggest a shape, I am more pleased with them. And the water is one of my favourites. Dyed, over dyed, painted, cut and reshaped. I hope this isn’t “too” out of the box for my fellow swappers. The most regal piece. I love the puffy paint bird and this is the 3rd piece that has one in the sky. There are smaller puffy fish in the water. The door is embossed metal with red fusible web inserts. The railings are thick black cord stitched down. 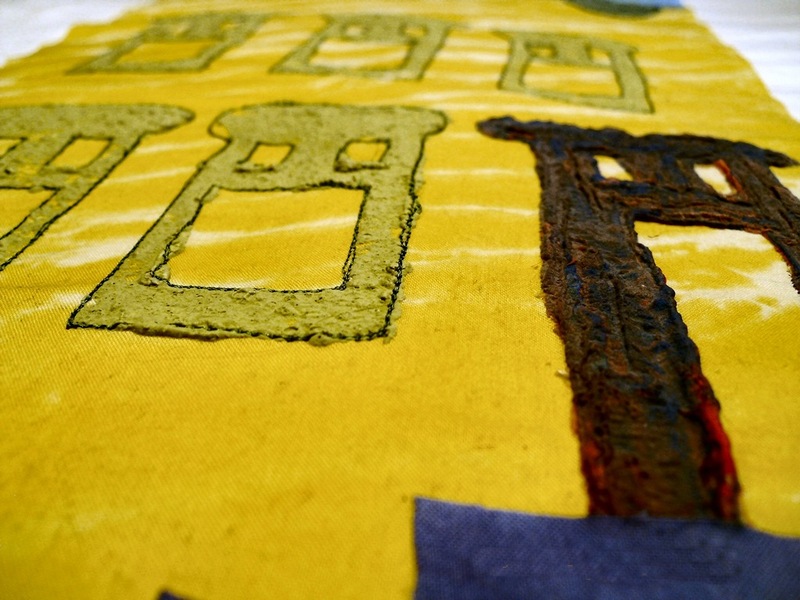 The house itself is one of my favorite pieces—a sun print with burlap inprints. 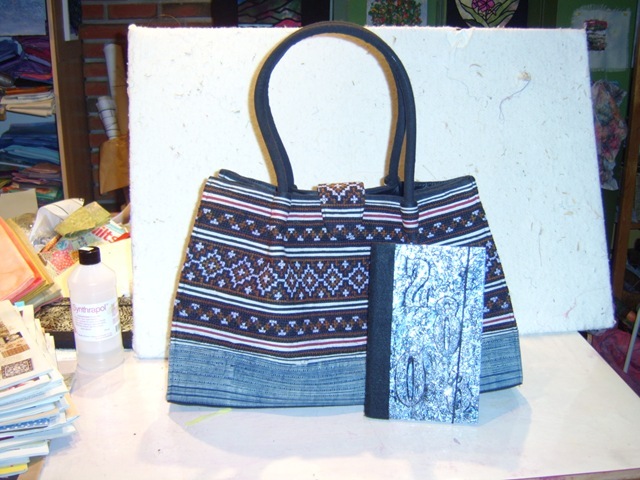 The roof is soy wax batik fabric. Last one—Whew! The haunted house!! I was working on some of these in early October and my thoughts were turned to Hallowe’en. This background fabric looked ominous and thus became the basis for the haunted house. 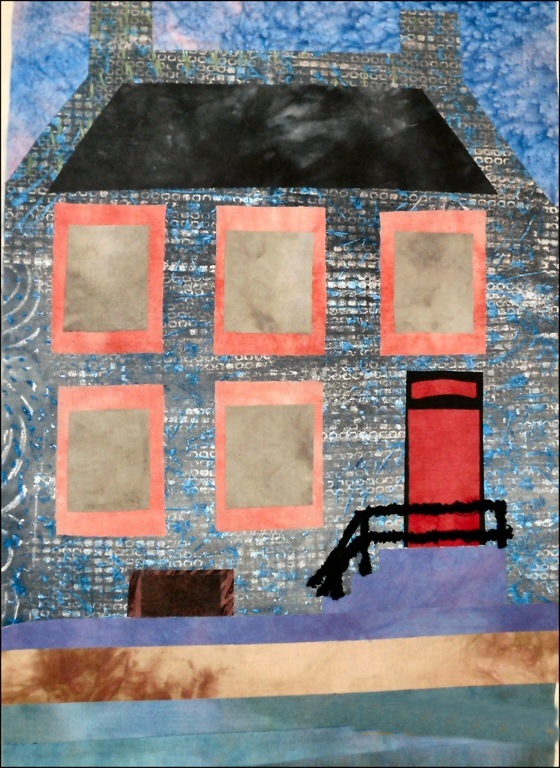 The sky fabric has thread in it to suggest lightening streaks, and I added a rock from the driveway to denote the moon. These were set in with Seta Color paints developed in the sun. I have NO IDEA if my swap sisters will be thrilled or pissed to get this—I hope the swap mistress decides on an appropriate recipient for this piece! And that’s it. It was very labour intensive, very difficult to think up all the different techniques to use on these pieces, but it was well worth it. I can’t wait to see how everyone else’s pieces turned out. 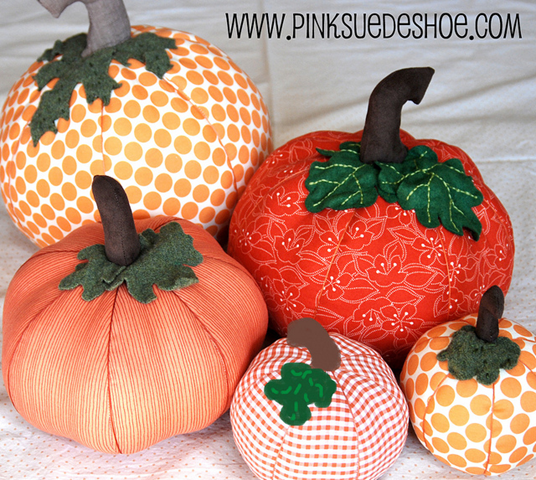 My friend Janet sent me a cute link to a stuffed pumpkin from Pink Suede Shoes that was super cute and that started my search for other pumpkin tutorials. 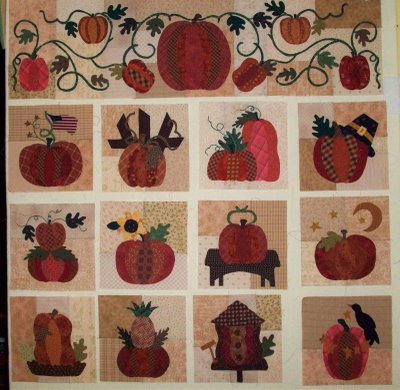 Here is rushed pumpkin at Polka Dot Pineapple that is interesting. 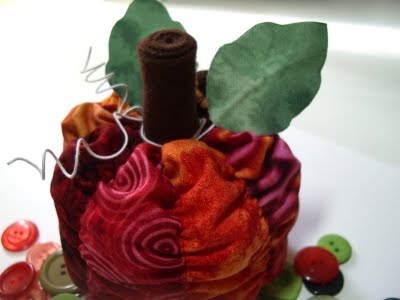 Here is a great 12 block pumpkin from Cottons ‘n Wool. Pattern by Briar Rose Designs. 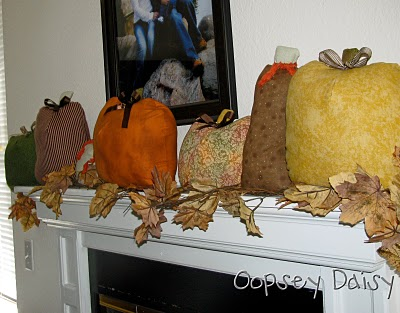 And lastly, I love these big ones from Oopsey Daisy on the mantle. I think I might do this! 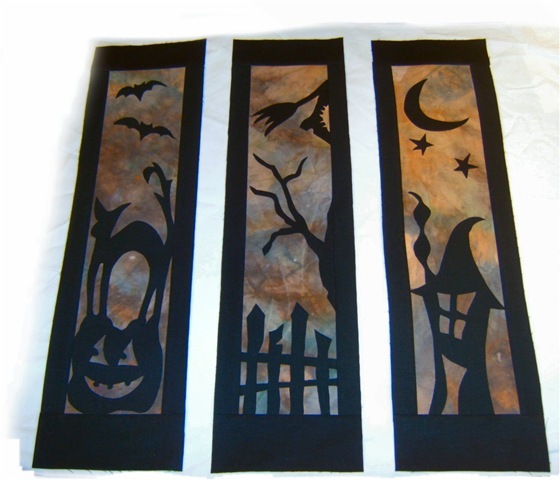 I have this cute wall hanging from Patch Abilities, Inc called Fright Night which is actually 3 patterns. I used a piece of hand dyed fabric that I thought looked ‘spooky’ and I really like these patterns. These are about 6 x 22”. I spent what feels like all day cleaning house, but this evening I have done a lot. 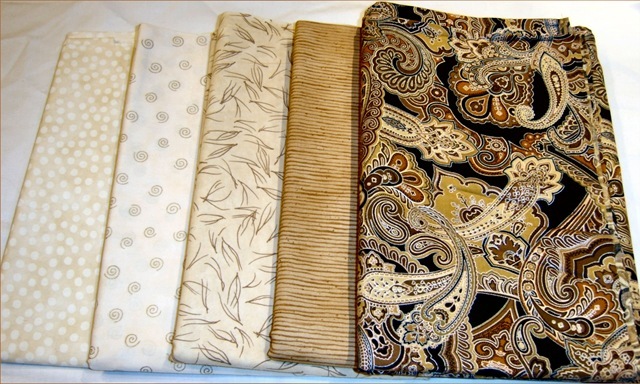 The wall hangings and I now I am starting a couple of hexagon table runner with these fabrics. Its fun since I don’t normally use commercial fabric for things. Looking forward to it! 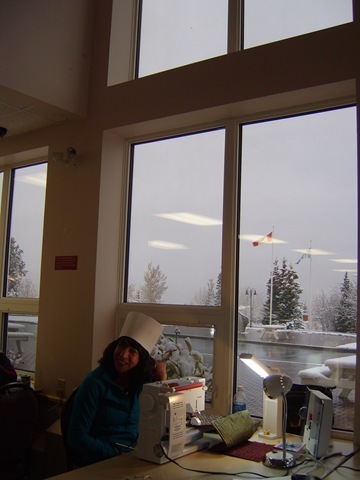 Last weekend my buddy Janet and I went to Haines Junction for the fall quilt retreat. 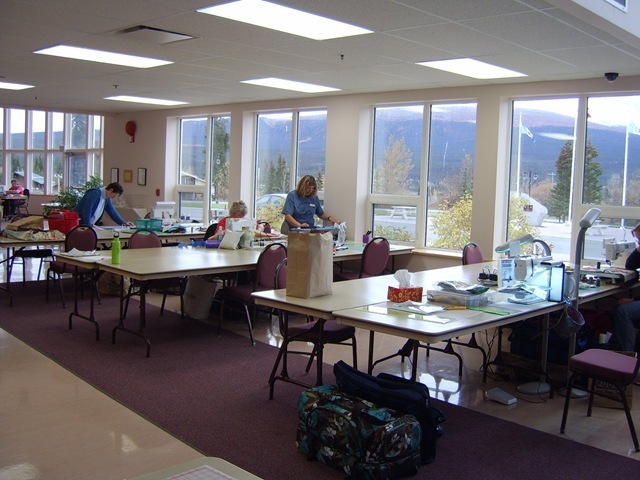 HJ is about an hour and half drive away from Whitehorse and I was looking forward to the drive in the beautiful fall. Instead it snowed buckets the night before and everything was white as far as the eye could see. Luckily it hadn’t snowed yet in the Village and I could take some quick pics of the mountains before it did so. And here is the rest of the Center where we are lucky to work out of. Upstairs is the Village council chambers. 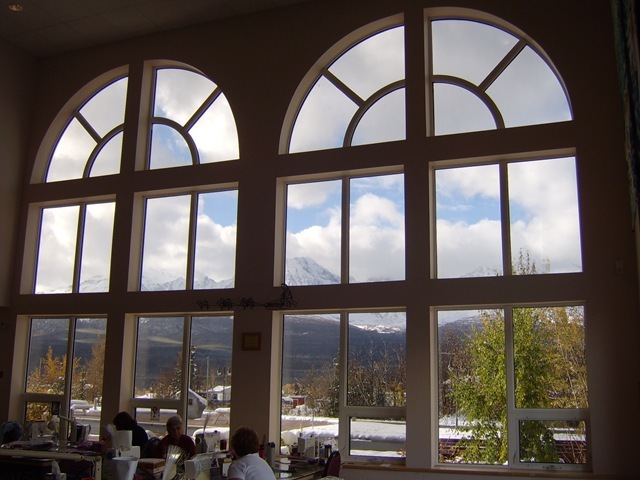 The Beautiful view of the Kluane Mountain range on Thursday. It started snowing about an hour after this pic was taken. These mountains are fabulous in real life..
We had to bring a present of something we liked but didn’t use. I brought this—a bag from Peru and a homemade journal. My little girl Ripley came with me for a day, then hubby picked her up and took her home. She loved it with all the ladies. This mess is, unfortunately, mine. 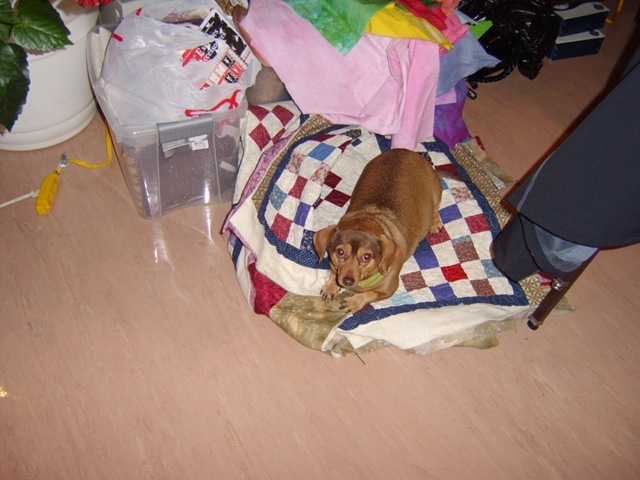 I am a totally messy quilter and am always embarrassed when others quilt with me. This is what happens when one gets spoiled by a big quilt space. I have yet to add the binding to this quilt, but Ripley loved it. Its for my house, so I don’t care if she sleeps on it now or when its done. 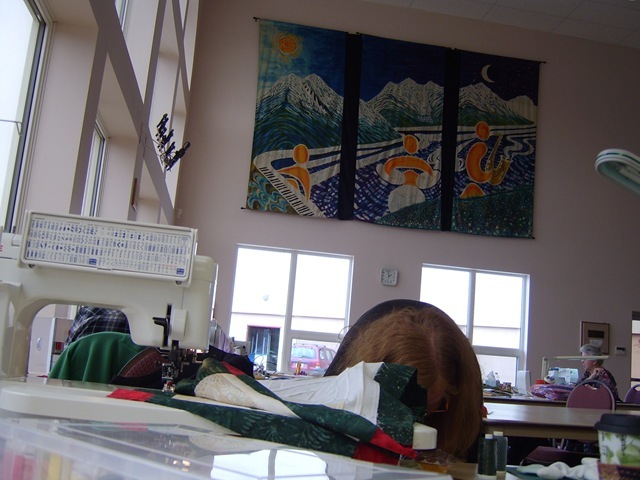 A lot of people work on quilts started elsewhere and finished at retreats, so it has become a habit to put all the finished tops and projects in the gym for bragging rights. Most of these tops were finished in the 4 day retreat! Aorry the pics are so dark—it is a big gym. I was happy to finish my baby quilt top with some hand dyes, and the wall hanging—mostly hand dyes. 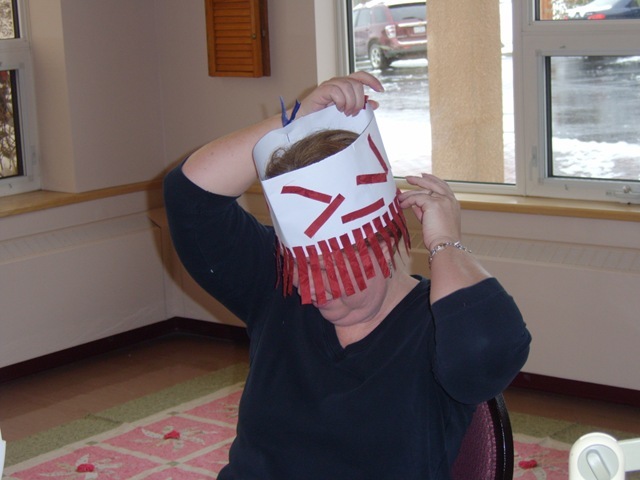 That silly hat I am wearing is a something we had to wear when prizes were being done as it was like a Chinese Auction where you could steal someone else’s prize if you liked it. The hats looked like chef’s hats, and I had to make it my own. In the background is my friend Janet. Below is someone else who had to decorate their hat. See the snow? See how obsessed I am becoming showing you the snow? It was a fabulous retreat and I can’t wait until next year to return! 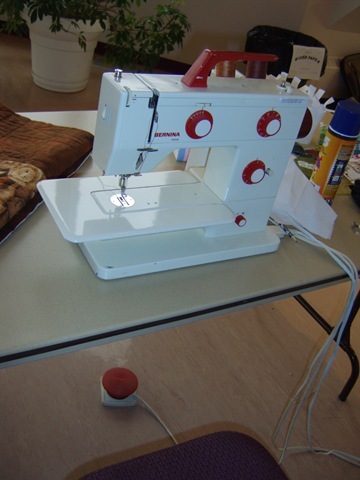 I was visiting Kay Koeper Sorensen blog today and was interested in seeing the ironing system she made. I LOVE it! When I look at it, I see that the legs fold in and maybe even tilts up to lean against the wall? That is a great idea, and I will be looking at how to make one of these. 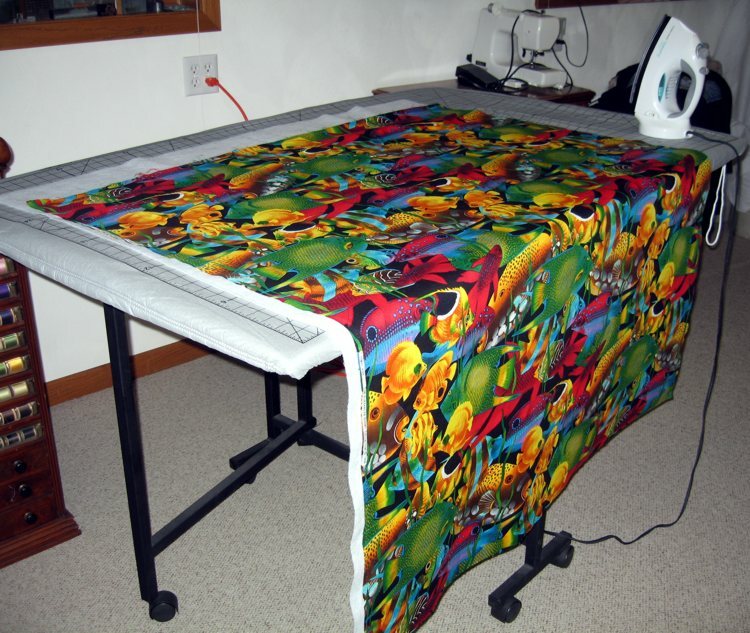 I currently have one that fits on my large table and I can lay out a 42″ wide piece of fabric, but then I have to put the iron on the floor to take advantage of every inch of the ironing space.I like that Kay’s table is wide enough to have an iron sit beside the fabric. It is just so silly! (and Heather has a great blog).. This summer my hubbie asked me to make him a camera case for his work camera, so I whipped this up for him. The cord is just pretty cords I zig zagged together. The scenery is free motion stitching. Another little things I made this summer was a few houses I am making for a landscape fractured swap with a bunch of crazy ladies. How do we get ourselves doing crazy things like these?? And they are HUGE. About 35 inches tall. I am doing a the windows different, and have a list of techniques I am doing on each. I cannot wait to see what everyone else does. It will be soooo much fun.! 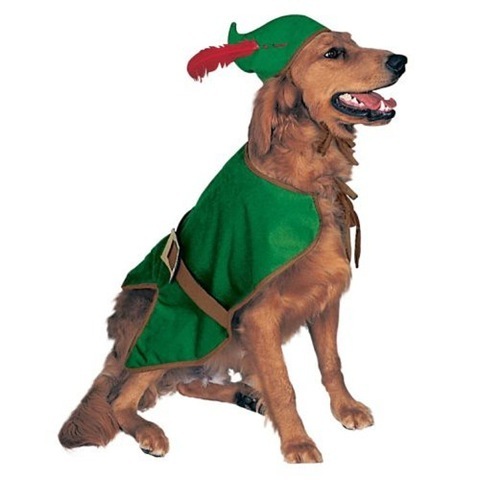 The last thing I am working on is making Ripley a nice Robin Hood outfit for Halloween. She is a dash hound so needs to look dignified. 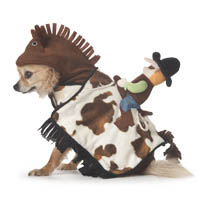 But if I could have found a saddle with a cowpoke on it, i would have!